Dr. Miles Restorative Nervine was marketed as a treatment for numerous “nervous” or stress disorders and anxiety related ailments, because of its strong sedative effects. It was also advertised as solving such common problems as heart trouble, negative side effects from smoking, signs of aging and the frustrations of annoying children. 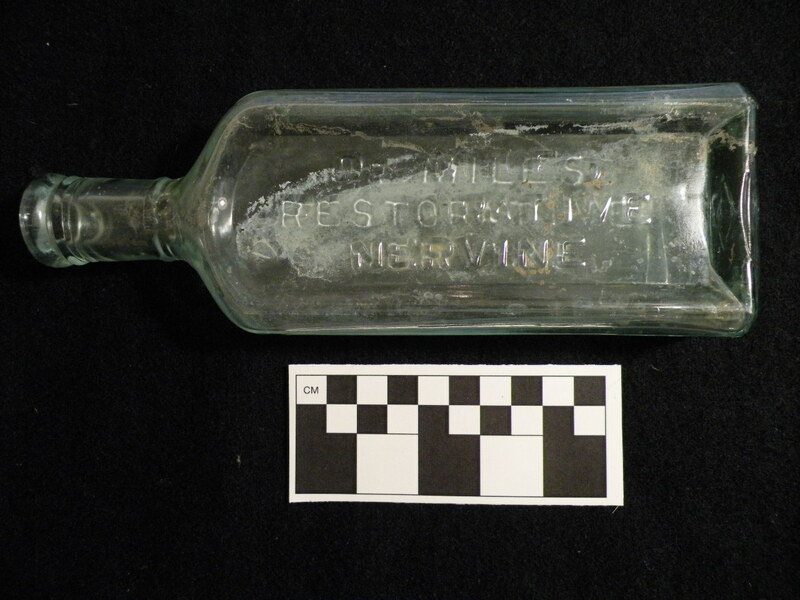 According to Indiana Historical Society, “In the early 1880s Dr. Franklin L. Miles began bottling and selling “Restorative Nervine,” which he prescribed for a variety of illnesses including nervous exhaustion, headaches, insomnia, backaches, epilepsy, and miscellaneous pains and spasms. The bromide sedative syrup was a precursor to modern tranquilizers. Miles had reason enough for nervous disorders in his own life. His mother and sister died in an epidemic when he was young, leaving him to be raised by relatives in Elkhart; his father, a fortune-seeker in California and Hawaii, was absent much of his youth; and his first wife died eight years after their marriage, leaving him with three young children. But the young Miles took the $5,000 he inherited upon his father’s death and financed an extended program of academic study, moving fitfully through assorted eastern and Midwestern schools and studying widely in law and medicine. Miles had a broad-ranging mind, writing prolifically on popular medical topics as well as expounding views on scientific child rearing and the dangers of monopoly. In addition to caring for patients and writing, he became interested in the relation of the brain and the nervous system to general health; his medications were an outgrowth of this concern. Dr. Miles’ Restorative Nervine and Heart Cure Calendar 1907, courtesy of Inferno55 on flickr. All I ask is if you use my material you leave me a mention at the bottom. The Miles Calendar is mine.I’m inferno55 on flickr. Thank you. Hello! Thanks for letting me use your material. I have added a note to the caption with your flickr name. The photo also links back to your site. Thanks again. You’re welcome. I just found 2 of my Hood’s calendars blank and left a message! Miles was an innovator with advertising, I specifically like his cardboard doll counter signs from 1899, in which the dolls clothing can be changed to suit the climate/weather which is happening during that time. His attention to customers has been lost by today’s advertisers. The doll could also be ordered for children to play with. Thank you for the mention on my Miles Calendar posted here. That’s all you need! The artifacts featured here were excavated and not purchased. I cannot make any claims to offer accurate appraisals, but for my own knowledge I look at sold listings on ebay to ascertain what others have paid for the item. Their phone:219-264-8405 at the time. Of you could please inform me.I would like to sell it. Hi, thanks for reading! The artifacts featured here were excavated and not purchased. I cannot make any claims to offer accurate appraisals, but for my own knowledge I look at sold listings on ebay to ascertain what others have paid for the item.